As any regular blog reader (or twitter follower) will know I visit Morrisons at the start of each month to see what that month's ale offers are. Since May or June they have had at least one ale available for £1 a bottle. In the summer months (before I started blogging about ale) there was Hobgoblin[baron rating 4/5], Ruddles County[baron rating 4/5] and Brakspear Bitter[baron rating 5/5] all available for £1/bottle - a great price indeed. It was with the Brakspear Bitter offer that things began to change. 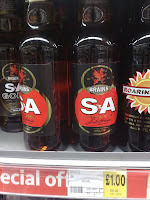 When I first saw it on offer in August, Brakspear Bitter was clearly labelled at £1/bottle with a nice big 'on offer' style shelf label. I bought a couple (and soon returned to clear the shelf after I'd sampled it). It was on a subsequent visit a week later that I noticed something strange. In its second week of the month on offer the discount shelf label was gone and so it was back to the same price as the majority of the ales - £1.67/bottle. I took some up to the cashier for a price check who confirmed that they were £1/bottle. It remained without a shelf discount label for the rest of that month and every week I checked and bought some more for £1/bottle - I must have been the only person who knew about the offer! The September Morrisons offers were pretty poor (small discounts on overpriced bottles compared to other places) so I waited for October. These were a little more promising with a great deal on 8-bottle boxes of Hobgoblin[baron rating 4/5] (8 bottles for £8) and a good price for Adnams Lighthouse[baron rating 2/5] pale ale - £1/bottle. This Adnams ale promptly sold out in the first week of the month never to be replaced for the remaining three weeks - it's shelf spot was filled with Adnams Gunhill[baron rating 3/5] but with the shelf discount of £1/bottle still mis-displayed in front of it. In the second week of October's ale month I was informed by @chilliupnorth (via twitter) that his local Morrisons (Redcar) was selling Marston's Victorious Bitter[baron rating 1/5] for £1/bottle. It wasn't until the fourth week of the month that this beer finally showed up on the Ormskirk shelves and was not marked as being £1/bottle but rather placed where Marston's Pedigree[baron rating 3/5] is usually located and so labelled as Pedigree at £1.67/bottle. A quick price check confirmed that it was discounted at £1/bottle. Are Ormskirk Morrisons staff members keeping all the cheap ale to themselves? Are the shelf stackers clueless about ale, have no idea where this stuff should go? 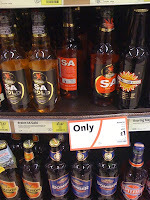 Is it that signs are removed as these ales are not the normal ones that my local Morrison's sells and so there's no shelf space for new ones? Is the local store management not willing to take the hit for the 'loss leading' ale discounts passed down from head office? So what do you think? Any Morrisons employees care to comment? Am I being far too pessimistic?